Halo comics have been absolutely killing it of late! The last two releases, Rise of Atriox and Collateral Damage, have established some incredible momentum for the franchise in this medium. Lessons have been learned from previous ventures and I have found myself at the point where there are no more ‘wait and see’ caveats with Halo comics. Not only have they consistently held their quality, but set new standards in Halo’s transmedia for storytelling – as I wrote a few months ago, Collateral Damage rather brilliantly subverted expectations around the conventional Forerunner MacGuffin formula. When it was announced that Linda-058 would be getting a solo comic, releasing over the first quarter of 2019, I was ecstatic (a word which here means ‘excited beyond words to see my favourite Blue Team character get her due’). I am even more excited to report that, with the release of this issue (the first of four), that momentum of quality continues to build and new standards continue to be set. 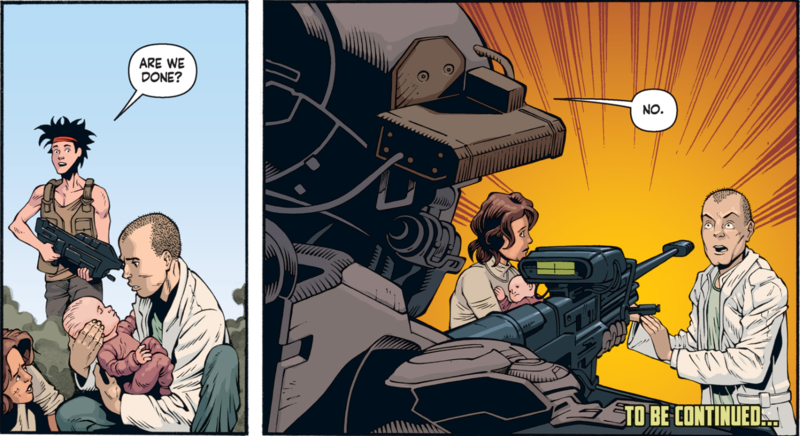 One of the most notable things about Halo: Lone Wolf is that it’s the first story to exclusively focus on Linda… ever. Blue Team stories have typically been about them as a unit, how they operate and work together in various situations, because they are – in the way Spartans are – a family. The first family we are introduced to in Halo, in fact, from the opening pages of The Fall of Reach back in 2001, as they took on a thousand Unggoy during the battle of Jericho VII, ending with the Master Chief watching the glassing of the planet from orbit. Sadly, it would not be inaccurate to say that Kelly and Linda have often been sidelined. Eric Nylund did a marvellous job establishing these characters. In more recent years, Troy Denning has taken up the torch and delivered some spectacular books that expand on Blue Team’s activities (Last Light, Retribution, and Silent Storm). But – of the team – the spotlight belongs to Fred in the former two books and John in the latter; Kelly and Linda barely get a word in. And so, this is something of an ‘event,’ in my eyes, for the series. The Mantle of Responsibility for Linda’s first solo venture was given to Anne Toole, a new writer for the series and somebody who I have crossed paths with before in the sixty hours I’ve spent playing Horizon: Zero Dawn over the last year. She has also written for Assassin’s Creed: Origins, The Witcher, and lots of other things you will likely recognise, which you can find out more about on her blog. Toole is an important addition to Halo’s pantheon of female writers, telling stories about its amazing women – new and old. One cannot understate the importance of womens’ stories being told, and that it is women themselves who are given the agency and opportunity to tell them. It is that unique perspective and voice given to these underused characters which adds a great deal of weight to this comic. On a broader scale, Halo media in 2019 is looking like something of a revelation because all the currently-known fiction is being written by women. The four issues of Lone Wolf are set to fill the first quarter of the year, but we’ve also seen the release of Cassandra Clarke’s Battle Born (the sequel, Meridian Divide, is coming in October), and Kelly Gay’s Renegades is releasing next month. Between Linda’s first solo outing; exploring more of the civilian dimensions of the universe from the perspective of teens; the continuation of Rion Forge’s story after the incomparable Smoke and Shadow… well, I think this is one of the most exciting strings of narrative content Halo has ever had. In summary: this is a positive, if long overdue step forward for the franchise. There’s still a way to go, but these are genuinely enriching developments for Halo. Lone Wolf begins with Blue Team (here referring to Fred, Kelly, and Linda) engaged in a war game – one set in a very familiar tower for those who have played Halo 2’s multiplayer (or, indeed, Halo: Reach’s). 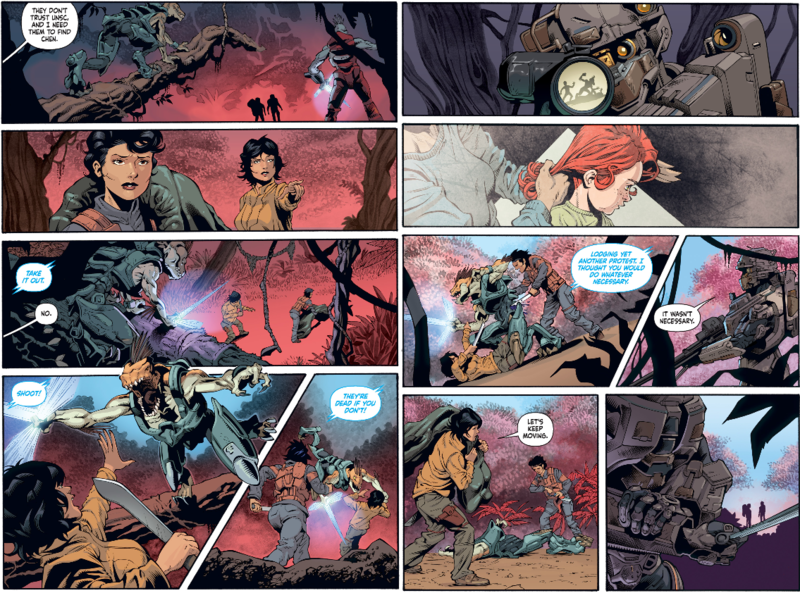 Opening the very first page with an Easter Egg like this calls attention to the visual details of the comic for veterans of the series, with its arresting combination of old and new aesthetics. Blue Team’s post-war armour and weaponry set against the backdrop of a classic Halo 2 multiplayer map is quite a thing to see! Style and substance coalesce as the scene unfolds from Kelly’s perspective. Her speed (her unique attribute as a Spartan) is shown to us in the comic by having her appear in two places at once – peeking around from cover, while also walking towards the doorway she’s looking at. Similarly with Linda, her skills as a sniper are shown by how she deals with a two-on-one situation against Fred and Kelly. Competing with a feat like that, anything is going to be less impressive, but it is nonetheless a good demonstration of her skill to show her shoot Fred and Kelly while in a spinning mid-air jump from her ledge. Speaking of dialogue (heh! ), its use from the start is genuinely layered. There’s a surprising level of interpretation that can go into the above exchange. Kelly’s line “Quick to offer support, never needing it,” is, on the surface, talking about Linda and her skill with a sniper. But the way that Linda responds to her – asking “Am I so different?” – flips that statement back on her, saying that Kelly is quick to offer support and is never needing it. It is left to the reader to decide what they think of that line. Is it just a playful comment that puts her and Kelly on equal footing, the implication being that Linda doesn’t see herself as any ‘different’ from her fellow Spartans? Or, is it a lighthearted acknowledgement of the differences between their skillsets? Some combination of both, or more? However you take it, it’s a wonderful and substantial little moment of friendship between these two women, which, as I said earlier, has been lacking from a lot of fiction. Beyond that, multi-layered banter like this is simply good writing. This is the first of a couple of exchanges where the comic demonstrates functional, forward-moving dialogue for the story that also leaves itself open for those who care to think about it. 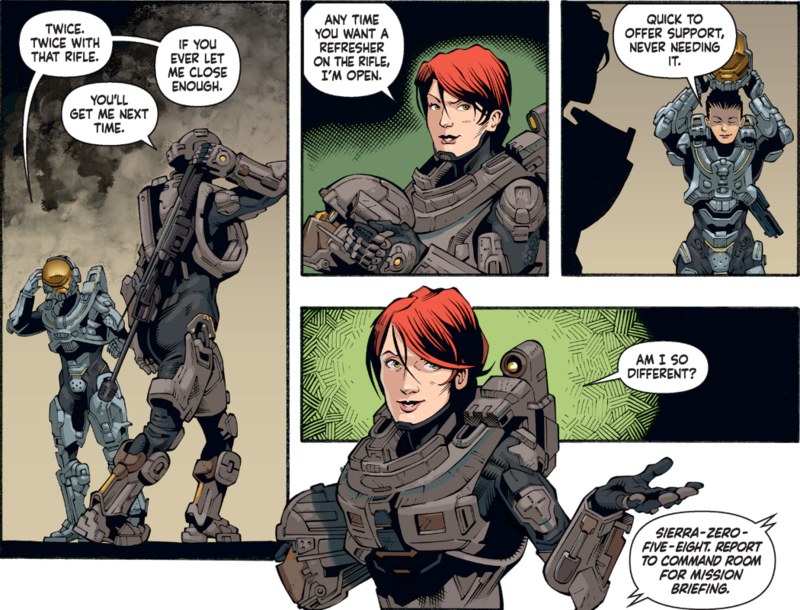 Regardless of Linda’s perception of the above questions, what matters in the set-up of this comic is that the UNSC sees her as ‘different.’ It is Linda’s specific skillset that is required for her mission, as she is called to the command deck for an assignment. The above panels confirm the timeframe for this story, placing it in 2553 (as the battle of Reach is said to have occurred “last year”), but when this specifically takes place beyond that does not appear to be particularly important. Here, Linda meets Athos: an AI affiliated with ONI, based on the character of the same name from Alexandre Dumas’ The Three Musketeers. In Dumas’ text, Athos is described as being secretive (a fitting connection to ONI) and had ties to Milady de Winter, one of the main antagonists of the novel – just as Doctor Chen once had ties to ONI. Something I really like about the set-up for this comic is how it connects back to Reach. The planet was the nexus of UNSC’s military-industrial complex, home to countless prototypes and pieces of technology that would’ve been scattered to the winds when the Covenant descended upon the planet. It feels right that there would be some long-term consequences – stories to be told – emerging from that particular debris field; things that ONI now has the latitude to be concerned about, given that the war is over. By rooting it in the universe’s history like this, it’s another little touch that makes the otherwise rather conventional inciting incident for the plot of this comic believable. Linda is informed that the distress call came from Sephune III, a world that is still largely controlled by “vestiges of the Covenant,” who are blocking UNSC communications. Further, the distress call they received used Covenant encryption, leading Linda to ask whether this could be a trap. One might recall the UNSC’s assessment of Linda’s personality from the Blue Team dossiers included in Halo 5’s limited edition. It is at this point that the more ‘morally grey’ aspects of this mission become clear. The war with the Covenant is over. Even though remnants continue to exist, Linda is being sent to kill one of their own people as if the extinction-level threat of the war is still going on. When Linda asks about survivors, the Commander dismissively waves her hand and says that they are to be extracted “if possible,” but that comes second to taking out Chen. Even in this period of reconstruction for humanity, taking lives is being prioritised over saving them. Upon finally meeting Chen at the end of the comic, it seems like he is being framed from the opposite extreme. But why is Chen just being written off as a liability by ONI? What has he stolen? What’s the story here? Lots of questions are already being established but Linda isn’t asking them, which is part of why she’s been chosen for this assignment. But there wouldn’t be a story to tell if Linda didn’t start asking questions, which presents an interesting opportunity for her character to grow over the course of the next three issues. Instead, Linda asks if there is a reason why she won’t be deploying with her team. The Commander simply responds with “Yes,” but does not elaborate further. Again, the writing is simple and minimalist, but layered. Just as the Commander expects Linda to answer the unspoken question of ‘why?’ for herself, so too is the reader. Athos, however, will be joining her. Aboard the Prowler, Athos speaks with Linda – informing her that communications are still being jammed and it’ll just be the two of them, his sarcasm in adding “But fear not. We both have the mission at heart,” earning a terse look. He asks how many AIs she’s worked with, to which we get another instance of her verbal ricochet (seen earlier with Kelly) where she flips the question back on him and asks how many Spartans he’s worked with. Upon landing on Sephune III, Linda finds a recently deceased UNSC soldier and decides to wait until the other humans come back for him. The next morning, we cut to the perspective of two women (Shel and Hala) from Chen’s group who have – as Linda predicted – come to recover the dead soldier’s body. From Shel and Hala’s dialogue, we learn that he was the one who used the Covenant’s comms to send the distress call, which put them all in danger. They believe it was a vain attempt at rescue, feeling that the UNSC abandoned them (setting up even more questions). It is interesting that much of what is revealing about Linda as a character is in how she steps out of the frame and simply observes the stories of others unfold before her. Giving these characters space to tell their own stories is something that really makes the comic come alive, building a complete picture from multiple perspectives rather than just those of Linda and Athos. Hala reassures Shel that Chen has almost “resurrected the Promise,” the frigate they arrived in, and sets off with the body. Athos questions why Linda isn’t following them, to which she replies by firing her sniper at an Ibie’shan Kig-Yar that was in-pursuit. 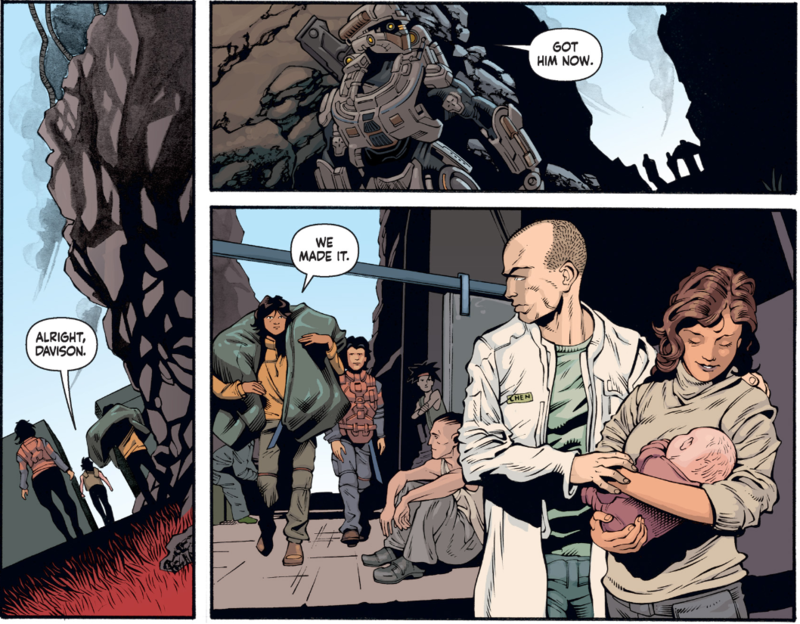 The sequence that follows is… one of the best things I’ve seen in a Halo comic. This effectively distills seventeen years of fiction into a single page (on the right) and is yet another example of this issue’s brilliant visual storytelling. Bear in mind that, while it’s something you could’ve guessed, at no point has it been explicitly stated that Shel and Hala are mother and daughter. That is made clear by this sequence, where the two are framed in the scope of Linda’s sniper as the Kig-Yar gets the jump on them. Amidst Athos’ protests to Linda doing nothing, she has a brief flashback to her pre-Spartan childhood – remembering her own mother. Shel and Hala prevail, killing the Kig-Yar with a machete. Linda says to Athos that her involvement wasn’t necessary. Non-intervention is, of course, something neither the UNSC nor ONI would never understand. We then see the silhouetted figures of mother and daughter balanced on the edge of Linda’s own knife, holding her wrist as if to stop it from shaking – a rare break in her stoic and eerily calm demeanour. I can’t wait to see what happens with this character thread over the course of the next three issues. We then get this marvellous new meme format! I wasn’t a big fan of Linda’s ARGUS-class MJOLNIR armour in Halo: Escalation or in Halo 5, but Lone Wolf is really turning my opinion around on it because of the quality of the art. For those unfamiliar with the reference in the armour’s name, Argus Panoptes is a many-eyed giant in Greek mythology. Seeing (heh!) that kind of angle in this comic feels like the armour serves a function as the character’s aesthetic, which is what I now know was missing before. At this point, I really want to credit the work of Kieran McKeown (pencils), JL Straw (inks), and Dan Jackson (colours), for how consistent the quality of their work is in this issue. Halo has always been a colourful universe. Despite its dire conflict, this is a series that has long been derided as “cartoonish” for not having a bleak, washed-out colour palette. 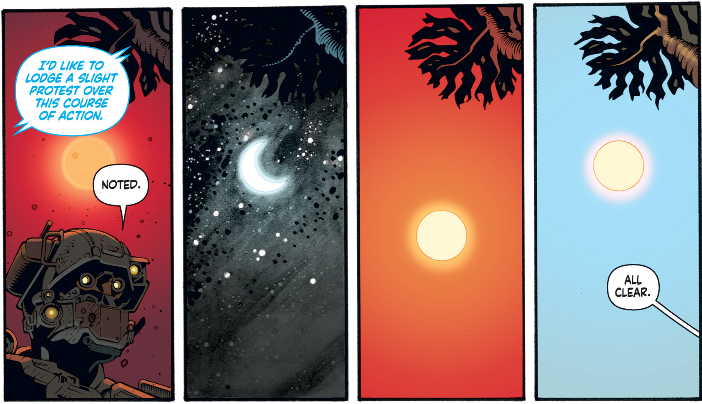 That vibrancy breathes life into the worlds we visit and this first issue of Lone Wolf has had a great variety of colours and tones which makes each panel a treat to look at, on top of its stellar visual storytelling. 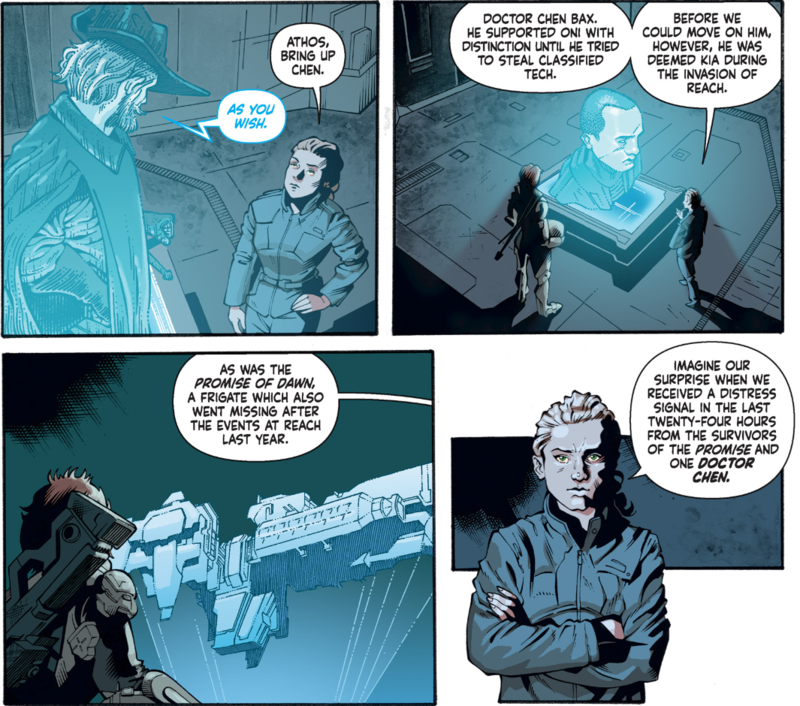 Where previous Halo comics have had lots of different artists working on each issue (in the case of Rise of Atriox, this complimented the nature of that series’ storytelling), Lone Wolf looks like it’s got the same people on-board for the remaining instalments. They’ve really set a good standard in this first issue and I hope the quality persists with the visual continuity they’re going for. As the issue reaches its conclusion, we meet Doctor Chen at his little outpost and see him tending to a young woman with her baby. Shel and Hala present the body of the UNSC soldier who called for help, with Chen deducing that it’ll only be a matter of time before the Covenant is upon them if he reached the Covenant’s communication towers. Gathering everyone around him, Chen is framed almost like a kind of cult leader as he orates about how Martel – the UNSC soldier – was a good man but didn’t truly believe in them. “Martel here was a good man. He worked for us. He fought for us. He tried, however valiantly, to set up a still for us. That didn’t turn out so great. But at the end of the day, he didn’t believe in us. Not enough. He put his faith – in a losing battle – over our safety. We didn’t ask to come here, but this is where they’ve left us. We didn’t expect to survive here, yet we have more than thrived. There’s an almost amusing cracked-mirror parallel to be made between Chen and Atriox or Jul in this attempt to establish independence, but his rhetoric here foregrounds even more questions. He refers to them as “humanity’s last hope,” which, considering the time they ‘disappeared’ (during the battle of Reach), might be indicative of this group not knowing the outcome of the Human-Covenant war – like the Sangheili on Hesduros, to further the parallel. Is that the impression he’s under, that they’re among the last surviving humans? Or, does he know otherwise and is withholding that information from his followers? Because the description of the next two issues is already available, we know that there is an AI that contains the bulk of human history involved in this story which may well play into Chen’s motivations. Is this what he stole from ONI? When and why did this occur? Perhaps he believed that humanity was going to lose the war and ‘pulled a Halsey,’ when she planned to get as many of her Spartans as she could and sit things out in a Dyson Sphere. Perhaps he gathered the people he could – the crew of the Promise of Dawn – and stole an AI full of human history because he believed this was the only way to preserve humanity. I’m incredibly excited for the next issue. Will Linda simply choose not to shoot Chen as part of a greater strategy? Will another childhood flashback affect her judgement? Will Chen’s followers come to his defence? Athos’ role thus far has been minimal, he effectively serves as a meta device to ask Linda questions a new reader might have in order to understand her thought process as a Spartan. So, how will he react to these developments? Lone Wolf #1 sets up lots of questions while leaving a lot of breathing room for its variety of characters to tell the story (excising the Forerunner element from the narrative is a welcome approach to this story too). As introductory issues go, this is very well-refined in its storytelling and the only criticism I can really raise is that there are one or two instances of grammatical slips in the dialogue. 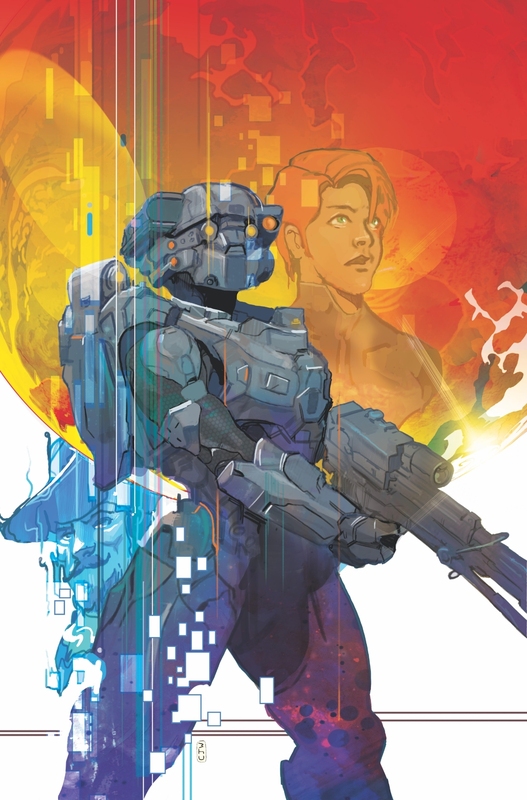 Linda’s first solo outing is shaping up to be a great one; if this level of quality holds, then this could be one of the best Halo comics to-date. Next issue (coming February 6th), the stakes are upped as the Covenant prepares to stage a larger assault, with Linda having to find a way to evacuate the humans in the settlement and discovering that Chen holds the key to a dangerous secret. You can purchase Lone Wolf #1 on Dark Horse’s site here. It’s also available on Amazon for your Kindle (UK | US), and a complete hardcover edition will be released June 25th 2019. Well, it’s looking good so far. Artwork is – serviceable. I have been holding off on purchases a bit though since Silent Storm. As for technology on Reach, do you have anymore thoughts on the Assembly? Were they the same as the ‘ONI super AI network’ (at least as a cover identity) mentioned in Halo Evolutions (Cole story)? Do you reckon any were still around to hear the Created’s ‘offer’ also? I do, in fact, have a draft article in the works on the Assembly. I’ll probably publish it a couple of months from now, as there’s A LOT of new fiction to cover. Sounds great. Looking forward to reading it! The idea they were linked to the ONI super AIs like Lacklustre is an idea I’ve had previously.